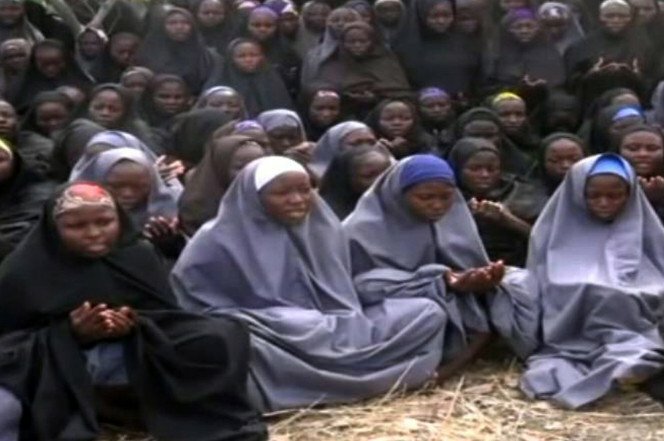 Boko Haram has released a second video showing some of the schoolgirls they abducted from Chibok, northern Nigeria. The footage released by the Nigerian Islamist group shows some 50 girls and a gunman who demands the release of fighters in return for the girls, and says some girls died in air strikes. Journalist Ahmad Salkida who had contact with Boko Haram has been declared a wanted man by the Nigerian army. Boko Haram is said to be holding more than 200 of the 276 final-year girls it seized from a school in April 2014. Non-Muslims were forcibly converted to Islam, and it is feared that many of the schoolgirls have been abused and forced into “marriage” by their captors. Parents of the missing girls have described their anguish at seeing their daughters in captivity. The video begins with a shot of a masked man, carrying a gun, speaking to the camera. He says that some of the girls have been wounded and have life-threatening injuries, and that 40 have been “married”. Speaking in the Hausa language, the gunman says the girls on display will “never” be returned if the government does not release Boko Haram fighters who have been “in detention for ages”. The footage concludes with footage of bodies, said to be the victims of air strikes, lying on the ground at another location. The militant also carries out a staged interview with one of the captives, who calls herself Maida Yakubu, in which she asks parents to appeal to the government. Maida Yakubu’s mother, Esther, is one of several parents of Chibok girls who recently published open letters to their daughters detailing the pain they feel at their children’s absence and their hopes for the future. Another girl among those standing in the background can be seen with a baby. Some of the girls can be seen weeping as Maida speaks. Boko Haram has waged a violent campaign for years in northern Nigeria in its quest for Islamic rule, and a faction of the group recently pledged loyalty to ISIS. Thousands of people have been killed or captured by Boko Haram, whose name translates as “Western education is forbidden”. Many of the girls abducted in Chibok were Christian. “We are being extremely careful because the situation has been compounded by the split in the leadership of Boko Haram,” he said. The Nigerian army declared journalist Ahmad Salkida a wanted man after he published details of the new video before it was released. Ahmad Salkida, who moved to Dubai a few years ago, has written extensively about the inside operations of the group. The Chibok girls had been thought to be in a heavily forested area of northern Nigeria. A girl said to be one of those captured, Amina Ali Nkeki, was found wandering in the Sambisa Forest in May by an army-backed vigilante group.